Awaiting the start of Thursday’s hearing, from left are attorney Nathan Rietmann, his client Gordon Shadle, Tom Cordier, and City Attorney Jim Delapoer. Why is it necessary to amend the Albany city charter in order for voters to approve the proposed bond issue to build a new police headquarters and main fire station? Could they not authorize the bond without amending the charter? 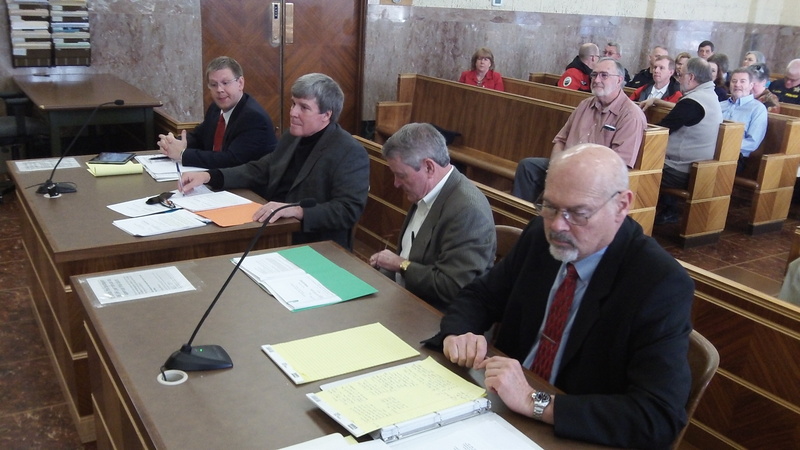 That question was left unanswered during this morning’s hearing in Linn County Circuit Court. Circuit Judge Daniel R. Murphy heard arguments on petitions by Albany residents Tom Cordier and Gordon Shadle, who had filed separate challenges to the ballot title for the $18 million bond issue election the city council has called for May 19. Cordier insists the ballot title — consisting of a “caption” or headline, a question, and a summary — is unfair because it doesn’t give voters the choice to approve one project while rejecting the other. City Attorney Jim Delapoer said the decision to have one bond issue for both project was a legislative or political one for the council to make and the council made it. Cordier told the judge that in his experience in commerce it may be illegal for monopolies to control the market by tying the purchase of one thing to the purchase of another. That, Murphy said, doesn’t apply to cities. Representing Shadle, his attorney Nathan Rietmann of Salem dwelled on the angle of the charter amendment. There’s no need to amend the city charter in order to ask voters to approve a bond issue, he argued, but if the charter is to be amended, that fact ought to be prominently mentioned in the caption of the measure. Murphy appeared to agree, mentioning that state measures amending the constitution always say so at the top before they get to the purpose of the measure. Delapoer said the city wasn’t trying to hide the charter aspect and would not object to the judge adding it to the caption. At the heart of Shadle’s concern is the idea that the charter amendment language seems to authorize up to $18 million in borrowing for any “public safety facility,” not just the current police and fire proposals, and that this authorization would be embedded in the charter forever, so that the borrowing could be done without subsequent elections like — in Cordier’s words — a “revolving door” for anything the council could relate to public safety. And this could be used to circumvent the charter requirement, initiated by Cordier earlier, that substantial borrowing must be approved by voters. After the hearing, I asked Delapoer why the bond authorization was proposed in the form of a charter change. He said it was written that way by the city’s bond counsel. Also at issue in the hearing: Whether Shadle’s Feb. 24 petition was filed within the required seven business days after the city elections officer, Mary Dibble, had “received” the title. The council adopted the title on Feb. 11, while Dibble was present as the council’s clerk and minute taker, and her public notice of the title said she received it as the elections officer the next day, Feb. 12. Delapoer said she actually received it at the council meeting, which would make the challenge deadline Feb. 23, as her public notice said, and would render Shadle’s petition one day late. Murphy noted that the clerk and the elections officer are the same person, but I detected no hint on how he will decide the deadline issue. Tom’s argument about tying arrangements was very interesting. And, if I understood the Judge correctly, he gave Tom several days to show that the city is subject to federal antitrust law. So, I’m not so certain that the Judge has made a final ruling in that regard. I came home and did a quick search on that issue. It was easy to find case law that clearly shows that cities are in the scope of these laws. States, on the other hand, are not. In regards to the timeliness of my petition – the city clearly and intentionally declared on their website that the Notice of Receipt of Ballot Title was filed with the City Elections Officer on Feb. 12, 2015. I trusted that the city was being truthful. That date in the city’s notice started the clock ticking in regards to the deadline for filing a challenge to the ballot title. In court they changed their tune by claiming the filing date should have been Feb. 11, 2015. They effectively asked the Judge to make me pay for their screw up. What little trust I had in the city’s integrity has now been reduced to zero. What a weird reply from Hare. He’s afraid of someone challenging this temporary, one-time bond measure so it needs to go into the charter? That is just silly. Did the city do this for the 2007 GO Refunding bonds? The 1999 GO street improvement bonds? The 1996 GO Fire Substation bonds? I don’t see anything in the charter indicating an amendment was used for these bonds. Hare kooky response creates the perception that he’s hiding something. What is it?